Sonicview 8000HD FTA Sat receiver "EXCLUSIVE 90 DAY WARRANTY" BUY safe! Want the best SONICVIEW 8000HD out there?. With everything I did to this receiver. MY RECEIVER UP-GRADE EXCLUSIVE. I DID MY USUAL REFURB AND UPGRADE TO THIS RECEIVER. WILL NOW CONNECT SECURELY TO THE RECEIVER. I DID MY USUAL REFURB AND UPGRADE TO THIS RECEIVER. Receiver is also in very nice physical condition. GRATE IN FRONT OF THE REAR FAN. I have repaired thousands of them over the years. Latest bin file loaded. SONICVIEW SV-360 Elite PVR Dual Two Tuner Digital Satellite Receiver FTA Free to Air. 3 USB ports. 1 on front panel, 2 in back. Parental lock function. Unit works. In good condition except some scratches. See photos. Original SV-360 remote included. No box. No instruction manual. You may be able to find instruction manual online. IN GOOD CONDITION FREE SHIPPING! 1-USER MANUAL. 1-950-2400MHZ 4X1 DISEQC SWITCH. Sonicview SV-HD8000 - Satellite Receiver, no remote. Condition is Used. 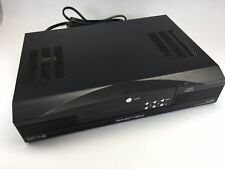 Very good condition SONICVIEW SV-360 ELITE PVR. No scratches on receiver or remote. Owners manual included. The mp3 world is huge with iPod and many other devices. Sonicview has brought the SV iHub to give you the music experience you crave. Use the SV iHub to load MP3's on your Sonicview and allow the power of your Surround Sound System or TV to play your music. Up for sale a Sonicview 8000 HD Font Panel LCD display. Used Item with very little use. And Is complete with remote. The Receiver is in good working condition. SV-360 Elite PVR. Plus dongle iHub. 1 - Sonicview 360 Premier PVR USB FTA receiver. We are Sonicview Authorized Dealer. FTA Receivers. kw=receiver tplsatus. Bckground Graphic Display For Radio Program Channels. We stand behind our quality products. Connector ports appear intact. We do not have the necessary resources to further test this device. Remote only. Does NOT include batteries. No other parts, cables, or accessories included. See photos.